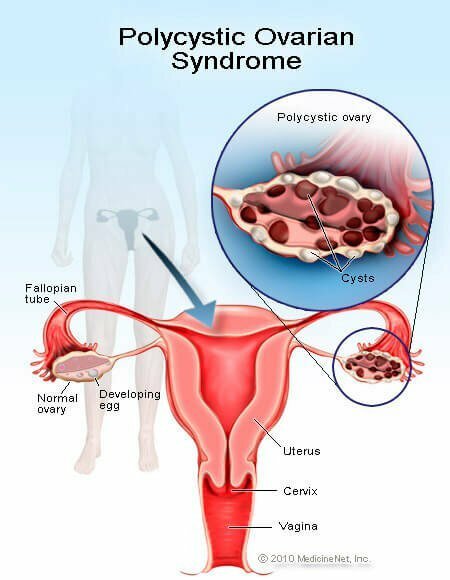 Polycystic ovary syndrome: Abbreviated PCOS. Polcystic ovary syndrome is a condition in women characterized by irregular or no menstrual periods, acne, obesity, and excess hair growth. PCOS is a disorder of chronically abnormal ovarian function and hyperandrogenism (abnormally elevated androgen levels). It affects 5-10% of women of reproductive age. PCOS is also called the Stein-Leventhal syndrome. Women with PCOS do not ovulate -- they do not release an egg every month -- and they are at significantly higher risk for high blood pressure, diabetes, heart disease, and cancer of the uterus (endometrial cancer). Much of this risk can be reversed by exercise and weight loss. Medication is generally prescribed to induce regular periods, thereby reducing the risk of uterine cancer. For acne and excess hair growth, the diuretic spironolactone (Aldactazide) can help. And for women who desire pregnancy, clomiphene (Clomid) can be used to induce ovulation. Studies have indicated that diabetic medications that are designed to improve the action of the hormone insulin may benefit women with PCOS. Long-term trials of these insulin-sensitizing drugs -- such as Avandia (rosiglitazone), Actos (pioglitazone), and Glucophage (metformin) -- for PCOS are underway. The results appear promising. A type of surgery called a "wedge resection" in which a piece of the ovary is removed also helps some women with PCOS. The cause of PCOS is unknown. However, the ovaries of women with the disease characteristically contain a large number of small cysts. Hence, the name polycystic ovary. Other common names are polycystic ovary disease, polycystic ovarian disease, and POD.